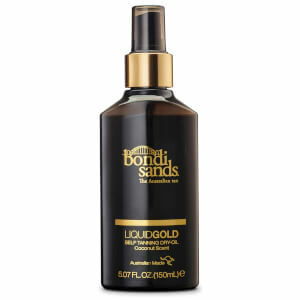 Achieve a sun-kissed appearance all year round with the Everyday Liquid Gold Gradual Tanning Oil from Bondi Sands. Infused with Coconut and Argan Oil, the deliciously scented formula applies effortlessly and develops over 2-3 hours to reveal long-lasting, bronzed skin without greasy residue. Inspired by Australia’s iconic beach, the salon-quality, dual-action dry oil nourishes and hydrates skin, whilst its dose of DHA maintains an even, streak-free golden glow with increased colour longevity. Features a pump spray nozzle for easy, mess-free application. Step 1: For an even streak free tan ensure your skin is clean and dry prior to application. Step 2: Apply Everyday Liquid Gold evenly onto the skin in circular motion. Wait until touch dry before dressing. Step 3: Use daily to ensure a golden tan throughout the year. Wash hands after use. I really enjoy using this product. I use it to top up my tan when it starts to fade or I just want to be really dark. I use it on top of the bondi sands dark mousse and it works really well. I spray it either onto my body or onto the bondi sands mitt and buff it out with it. It isn’t greasy at all and it smells lovely. It fades really nicely and evenly. It does take a while to develop so I wouldn’t recommend this to use if you want to see a different straight away. I’ve had the same bottle for about 9 months and I still have about a quarter of it left. If you’re using this on it’s own I think you would go through this quickly as it takes a few layers to build a nice tan. It’s is very difficult to apply, you don’t know how much you’ve applied and how evenly and therefore ends up a bit hit and miss potentially resulting in patchiness. It doesn’t have a biscuit smell though so that’s a major plus! This smells gorgeous and applies like a dream drying within seconds. I am fairly light although not extremely pale with warm undertones. I go a bit pinky in the sun first but then turn golden brown (Fitzpatrick 3). Unfortunately this product left me with a very yellow looking colour that screams fake. What a shame as it's sooo nice to use. If you skin is anything like mine I would be on a cautious side. Yellow tan is not what I am aiming for so I will definitely not repurchase! Okay, so where do i start? I have been trying all kinds of tanning brands through out the years, and have finally come to the conclusion, that Bondi Sands is by far the best. This product really makes a change to every tanning application. The Liquid Gold Gradual Tanning Oil just gives something extra to you skin, and for sure makes you a glowing queen/king. 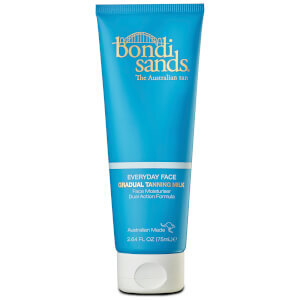 I use it as an extra something after i've applied the tanning foams from Bondi Sands. It is a fantastic combination that everyone should try, and is why i highly recommend all products from Bondi Sands, and especially this beautiful product as it just gives you some extra confidence.